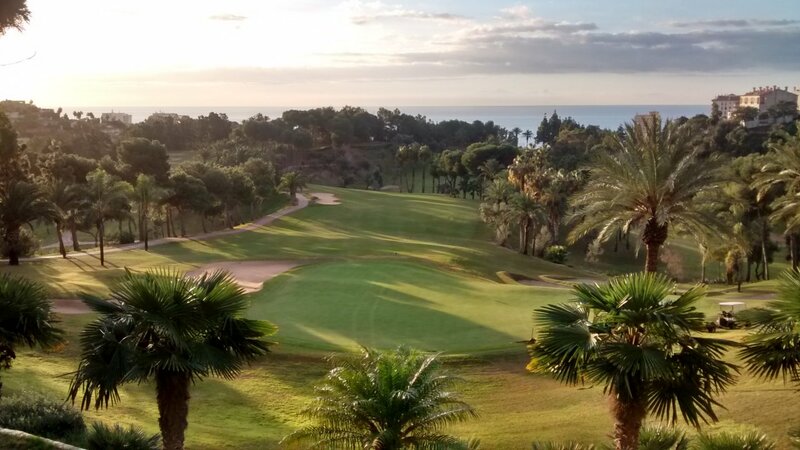 Located halfway between Fuengirola and Torremolinos, this golf club is about 35 years old. I suspect about 25 years ago it was quite a high-ranked club on the Costa del Sol, but since then things have moved on. The centre of gravity for golf on the Costa has shifted further West (now with Marbella as middle point). Clubs that have stayed upmarket have become much bigger operations with longer courses than Torrequebrada is now. Torrequebrada currently is in a very densely built-up area of the Costa del Sol and I suspect the people living around there are more cafe/restaurant/bar culture than golf culture. Certainly the typical Torremolinos visitor is going to pay only rock-bottom rates for golf, so is far more likely to visit a cheap-and-cheerful club like Miraflores than Torrequebrada. The club is privately owned by a wealthy gentleman from Madrid. I hear from members that the club does not really care too much about attracting lots of new members. The owner can do with his golf club whatever he wants to do. But I still review clubs/courses always for people looking for good-value golf on the Costa del Sol. The Torrequebrada course itself has a fine original layout. Fairly up-and-down, most holes have a nice variety of slopes and turns. Possible to walk, but a fair bit of exercise. No large distances between holes. First time out, you might not play quite as you like, because you simply do not fully understand the various undulations and 'best lines to play' on each hole. Naturally playing the course a few times removes that problem. There are no hole maps out on the course, but the scorecard has accurate maps for each hole – including major slopes. The fairways here are generally medium-wide and good quality. Certainly above the average quality of courses on the Costa del Sol. Well grassed and mowed. They are obviously working hard to keep the nice original fairway grass from being invaded by the tougher wiry grass that wrecks fairways. It is easy to take a large divot from a fairway shot here. This is no bad thing – it shows the basic fairway construction and grass is top-quality. Tee boxes are a bit messed up. They should be fixing all the divots there more often. There is not much true rough on Torrequebrada. If your shot misses a fairway wide, you typically end up in a bunch of trees (mostly pine, some palm and gum). Nothing too severe – you can get some kind of shot out easily enough. Basically, there is no killer rough on the course. The first cut up to 10 meters off the fairway is consistently fluffy grass about 3-4 centimeters high. Your ball can sit down in that and the grass grabs your club. The answer is to chop down on the ball rather than try to get a full swing. Not a problem really, just a factor fairly unique to the way they manage the grass just off the fairways at this particular club. There are a reasonable number of bunkers on the course. Well positioned, but not too aggressive. Good quality sand, very well maintained and quite shallow. In short, not much of a threat and easy enough to get out of. There are 4 or 5 quite large lakes on the course, scenic but seldom a true hazard. The greens at Torrequebrada are good quality. About half are elevated. All are medium-fast and big. Some tiered, virtually all have significant slope and undulations. So quite easy to hit each green, but 2 putts to get down can be a hard challenge. You have to plan on slow curling putts rather than ramming the putt straight at the hole - which if you miss can leave your ball several meters away from the hole coming back at the hole, or even off the green altogether. In short, putting here is a very good challenge and the most difficult part of the course by far. The course is really quite attractive in a mature way. But it is not cheap. I paid for a round by myself the sort of price at a quiet time of the year that I thought really quite a lot of money. I also paid €10 to rent a trolley which I thought irritatingly high. If a course wants to improve its income, it should price to get in lots more players who are going to spend money on drinks/food, not by charging a mildly rip-off €10 for a trolley which should seldom cost more than €5. I really don't care about an extra €5. I do care about the sour taste that this kind of BS pricing leaves in my mouth. Which brings me to the main issue I have with this club. Value-for-money. I just don't see it here. I do not mean only for the casual player. The membership deal I asked about I also thought not particularly good value compared to offers from other similar clubs on the Costa. It seems this club lives in the past and is out-of-touch with what other courses now offer as business deals. A nice big clubhouse and fine course design is not enough. It just feels that this club has no soul. Perhaps they should have a proper discount membership drive to raise the number of members from what seems unsustainably low. Something – anything – to give this club a bit of a shakeup and reality check. Of course if the wealthy Spanish owner of Torrequebrada does not really care about making more money from his golf club, then perhaps nothing will change. So do I recommend Torrequebrada ? Yes, I do. It is an interesting and varied course for most handicap levels. It is just so different from all the other courses I play on the Costa del Sol. But I personally only choose to play it willingly if I can get a discount e.g. through a golf society. I strongly recommend you fix the prices over the phone before visiting the club. All this is no bad reflection on the staff working there, by the way. They were uniformly polite and helpful. Review last updated: December 2014. Number of times played: 2. Torrequebrada is the yellow dot. At about 5800 meters off the yellow tees it is average length for courses on the Costa del Sol. Slightly less than average difficulty - probably due to generous fairways and greens, little true rough. An 18-handicap player can expect to go around this course at 19 over par.